Did this ending really feel right? All of the parasite activity just conveniently dying down and Migi going to sleep? It almost seemed like the ending was a forced “everything worked out” scenario. Maybe I’m just upset that the parasites’ origin was never explained…maybe I wanted Satomi to eventually find out about Migi. I guess I can see a point where the show is trying to introduce these parasites as though they were basically another natural species trying to coexist, but it just doesn’t follow that they would just appear. I’m sure I was supposed to get some big message about humanity in this final episode too, but I just wasn’t really hearing it. There is some truth in what the serial killer said in that humans defy their nature in how we try so hard to keep ourselves alive to the point of rejecting things like natural selection, but that’s not exactly a new message. But anyway, this show hasn’t been too bad of an experience…just a lot of questions, I guess. 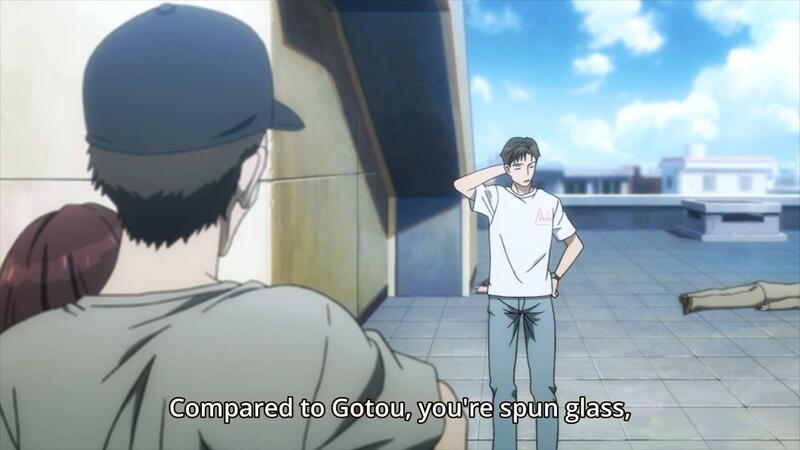 As expected, Migi returns this week at the critical moment to save Shinichi and help defeat Gotou. Honestly, I wasn’t expecting Gotou to have assimilated Migi…the nature of Migi’s return would have been obvious if I had known that. The point at the end isn’t really anything new…humans have long had a sense of arrogance when it comes to our place in the evolutionary ladder, so there are always stories of creatures to keep us in check. Anyway, next week should be the final episode…presumably, it’s going to be an epilogue without too much happening. I guess my only real hope is that Shinichi finally tells Satomi the truth about himself. 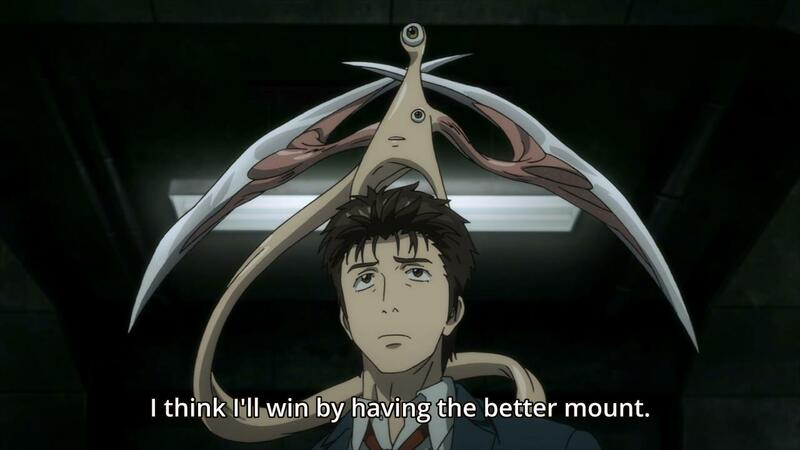 Now that Migi and he are “friends”, I would hope that the fear of Migi killing her if she ever found out would be gone. Plus, it’s about time she knew, right? Well, this week basically covers another confrontation with Gotou. Migi shows off some humanity by sacrificing himself to save Shinichi. Given that Migi “dies” off-screen, there’s no way it was true death, but it does beg the question of whether the piece that separated from Shinichi was able to get away or whether the small piece that revealed itself in what was left of Shinichi’s right arm is all that remains. I guess I’m a bit torn on whether it makes more sense that it lived or died. Next week, I’m assuming we’ll have the final battle against Gotou. I suppose we’re going to be seeing what remains of Shinichi’s right arm helping out, but there’s also a slight possibility that the separated right hand survived somehow and will return to help…who knows? Either way, I’m guessing next week finishes the fight and the final episode is left for some wrap-up. I don’t really think I see this fight lasting two episodes. Well, that was certainly hard to watch, but I understand Shinichi’s fear when Migi is asleep. Other than that, Gotou’s massacre of the police wasn’t too unexpected. Also, was I supposed to feel more shock when it was revealed that the other guy helping the parasites was actually human? That character just felt so minor to me. The point he brought up at the end was fairly valid, though. As humans, we tend to think of ourselves as the pinnacle of evolution, but we really just leech off of the world with very little regard for it. This week’s episode really does bring up an interesting idea. When faced with monsters that outclass us as humans, do we have to throw our morality out the window? The soldiers in this week’s episode develop an “shoot first and ask later” mentality when faced with the threat of the parasites. I wouldn’t be surprised if someone tried to link it to the police brutality questions we’ve been seeing in recent news…I’m certainly not going to open that can of worms, though. So I haven’t been paying full attention. 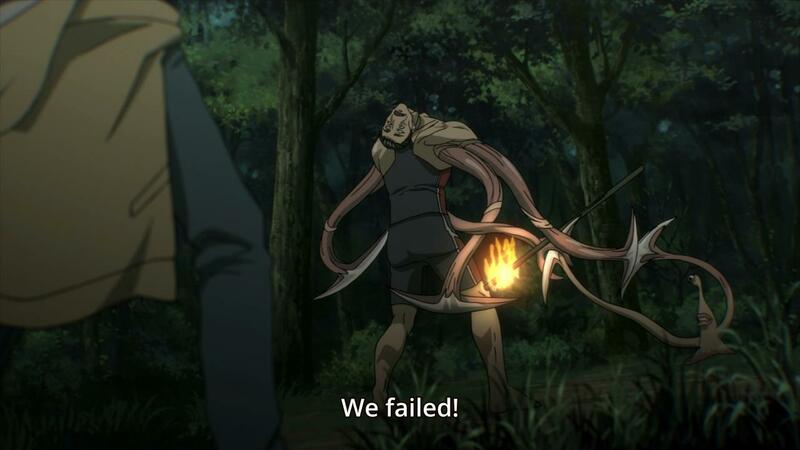 Based on how strong he was, I’m assuming the guy at the end that wiped out the unit of soldiers despite was the one composed of five parasites. It explains why he wasn’t killed by the initial shots. Anyway, next week I guess the battles continues. Maybe it’s time for Shinichi to join the battle? He didn’t exactly get to do anything this week. 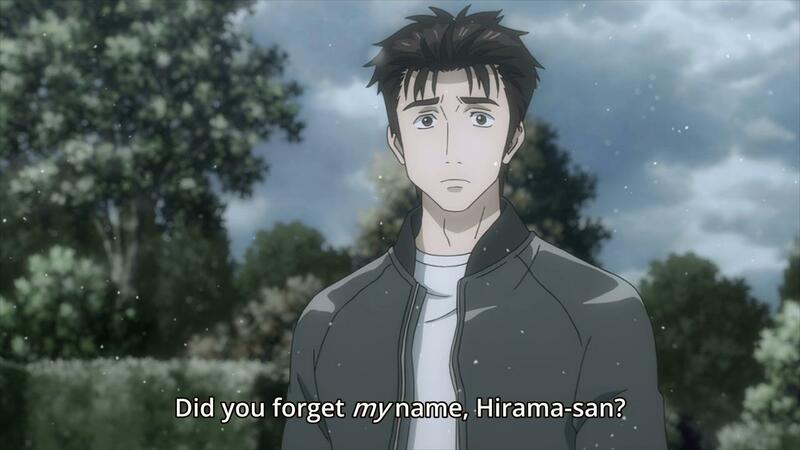 Parasyte Episode 19: War begins? So it’s finally time for the humans to fight against the parasites? Also, I’m really surprised Shinichi wasn’t busted by the convict, especially when the two met for the second time (Migi seemed active at that time). Was he purposely acting ignorant or is his detection really not that good? 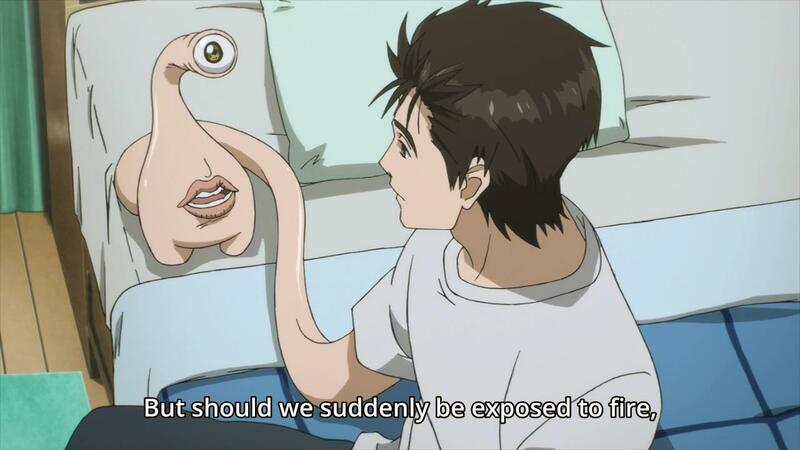 I thought Kana was able to detect Shinichi even when Migi was asleep. Next week is presumably the actual confrontation with the group of parasites. The preview made it almost look like Shinichi would come face-to-face with the mayor himself. There are a lot of shocked faces in the preview too…is it wrong of me to assume that the raid doesn’t go so well even though they were able to detect the first parasite fairly easily? Author marthaurionPosted on February 19, 2015 Categories ParasyteTags kiseijuu, migiLeave a comment on Parasyte Episode 19: War begins? Tamura Reiko’s death ended up being kinda dull in my mind…maybe death by gun just has that effect on me. However, it seems that it was enough for Shinichi to get back in touch with his lost emotions. I guess that means that Satomi is finally back together with him. I’m still really annoyed that she doesn’t know his secret yet, though. There was one thing Reiko said before dying, though, that has me curious. She mentioned that the parasites and humans are two parts of a whole and parasites are children of humans. I’ve had a nagging suspicion for a while that the parasites are born from a science experiment because of the synchronized timing of their appearance. Could this finally be my proof? I see the detectives have brought in an expert to take a look at Shinichi. Presumably, this criminal is similar to Kana, a human that can detect the parasites for some reason (I really wish they would explain how). Given how easily Kana was always able to detect Shinichi, this guy should also have no problem. It looks like next week, we’ll have to see just how much the criminal can see. If he still detects Shinichi’s humanity somehow, he may totally rat him out. So it was Tamura’s baby after all…that detective’s story sure was short. Tamura is revealing herself to be one of the more studious parasites and it seems to be paying off in some areas. She’s able to kill her own kind with moves that they don’t expect, but she also gave herself a weakness of sorts (I know the general anime message is that love isn’t a weakness, but she gave herself an alternate target). Now Shinichi and Tamura meet…again. Since she’s starting to experience some human emotions, maybe they’ll team up? Will he be able to do so after finding out that she killed the detective? Also, what’s Satomi’s role in this encounter? More than likely, she’ll be caught in the crossfire, but will she just finally learn Shinichi’s secret or will she…? So it looks like I was wrong to assume the multi-parasite enemy still had a human mind. Apparently, he was just using the parasite that had studied the most on human expressions as the head. What can I say? Some people switch to battle mode with yellow auras…some people have to get their head cut off and replaced with a different one. I didn’t predict that one. It looks like this time the enemy is similar to Shinichi, but with theoretically three times the power. But I presume there’s also the possibility he will help Shinichi given that he appears to have a human mind. But why is a human fighting with this group of parasites anyway? 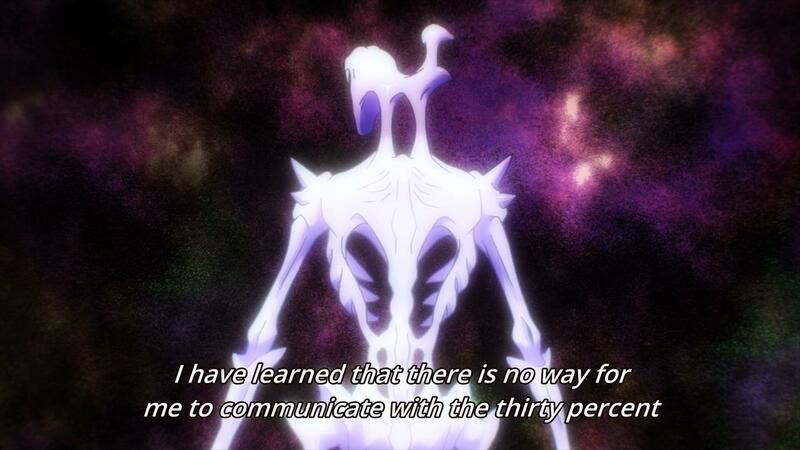 Has his brain become too warped like Shinichi’s is starting to become? Also, what was up with that brief moment with Satomi? 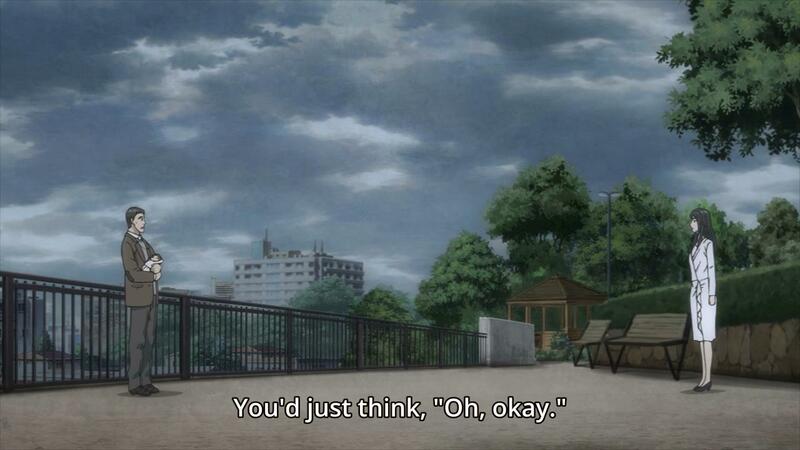 Has she finally realized what Shinichi was hiding or has she just decided to start trusting him again? Next week’s episode looks to be more fighting. With the title “Happy Family”, I would guess that the old man that appears a couple of times is the parasite that will be battling Shinichi and the title has something to do with his human background. Surely we can’t be talking about Shinichi’s family, right?